As criticism continues to mount over Israel's violation of Palestinian human rights and of international law, campaigns to silence and repress those who speak out against Israeli apartheid have grown alarmingly. College and university campuses across the United States now find themselves centre stage in this conflict over free speech: targeted by the Israel 'lobby' for the critical content of their scholarship, academics have been turned away from jobs, denied tenure and promotion, rejected for funding, and even expelled from institutions, while student groups like the 'Irvine 11' have faced harassment and sanctions. 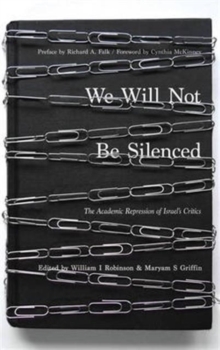 From establishment figures like Richard Falk and former US Congresswoman Cynthia McKinney, to professors, postgraduates and activist alumni, We Will Not Be Silenced contains thirteen testimonials from those whose struggle to defend their academic freedom has garnered widespread public and international attention.